Some parts of Colorado will be wrapping up their potato harvest this week. 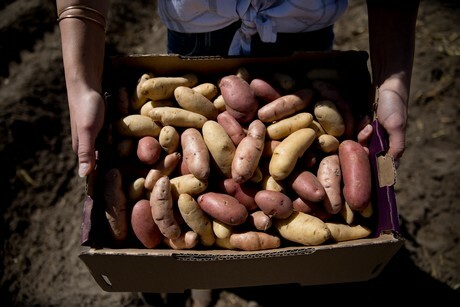 Strohauer Farms, located in La Salle, are one of just a handful of growers in the northern part of Colorado, away from the potato-industry-significant San Luis Valley. Because of its location, the company is able to begin harvest earlier than their counterparts in the Valley and subsequently can get fresh product onto market earlier. "We are the only potato grower in this area," said Amber Strohauer. "Typically, the San Luis Valley harvest begins in mid to late August, but in the north here, we are able to start a little earlier. Our harvest started in the last week of July and is finishing up this week. Strohauer Farms also has acreage near where the borders of New Mexico, Oklahoma and Texas meet, where we are able to harvest potatoes even earlier." Strohauer added that the area received hail storms which are quite common in the region, but can potentially create a few issues. "We did get hit by some hail which is not really unusual as this area is susceptible to hail storms," she noted. "Fortunately it had little effect on our potato crops, although other crops like shallots suffered a greater impact. Hail can compact the soil which can be a challenge sometimes. However, potatoes overall are quite resilient." The market has been strong since the fresh potato market opened. Despite the backlog of storage crop holding the market back a bit, growers are overall pleased with how the new season has started. In Colorado, the local market is also flourishing, as is the Mexico market for which Colorado is well located. "Prices have been pretty strong and we have seen good demand from the local market," Strohauer observed. "We are located only 50 minutes north of Denver which means our potatoes can be in the store the same day. This is very advantageous because, although we distribute nationwide, there is also a strong focus on the local market." Interestingly, there has been a move by retailers to move some varieties of potatoes back into bulk rather than in consumer packages, although Strohauer said this approach fits best on the mainstream varieties like russets, reds and yellows. "We do a lot of retailer packages as we also have a focus on specialty potato varieties," she explained. "A number of retailers are transitioning out of packaging and into bulk. But if you have a specialty item like fingerlings or colored potatoes, then packaging is still preferred because it provides a good opportunity for marketing." Particularly strong this year are the organic and fingerling potatoes, Strohauer noted. The company are expanding their organic acreage in response to the demand for organic potatoes. "This year has been a good one for potatoes and we have seen good growth in organic demand, particularly in the local market," she shared. "We expand this category every year and have increased acreage to help meet the demand." Strohauer said part of the reason for the growth is that consumers are falling in love with potatoes once again after the period of carb avoidance has made way for diets focused on natural foods. "There was a time when people were avoiding carbs. However, consumers are now returning to eating whole foods and are more concerned about the source of their food. Additionally, people are discovering new recipes and new ways to use potatoes thanks partially to high-profile chefs and TV shows which highlight the different uses of potatoes."